This adorable little stuffed Big Horn Sheep, part of the Aurora World Mini Flopsies collection, is sure to delight with its soft tan fur, white accents, and stately curled horns. With a cuddly understuffed body and sweet brown eyes, this plush ram is the perfect size for imaginative adventure. Big Horn Sheep Fun Facts: Did you know that male bighorns are called rams and that their horns can weigh up to 30 pounds? That's quite a load to carry on your head! Female bighorns are called ewes and also have horns, but they are smaller in size. Big horn sheep are related to goats and have split hooves which help them balance in the rough and mountainous terrain they call home. And what is a group of big horn sheep called? A herd! This adorable little Mini Cuddlekins stuffed big horn sheep has a soft tan body and fabulous corduroy horns. Majestic yet huggable, this Cuddlekins stuffed big horn sheep has a soft two-toned brown body with white accents. Standing or sitting, you'll love this adorable plush ram's soft cream fur, tan hooves, and stately tan curled horns. 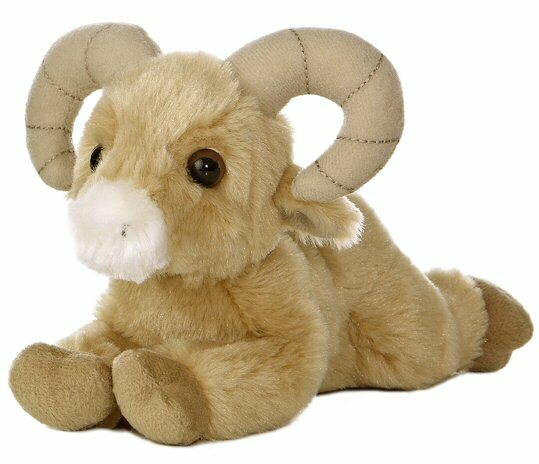 This adorable ram stuffed animal has soft cream fur, a sweet face, and gently curved tan horns. This plush cougar has a cuddly understuffed body with soft tan fur, cream and white accents, and a long floppy tail. Mini Flopsie Liberty Eagle, this regal stuffed eagle, has soft black "feathers," soft white fur on his head, and amazing yellow eyes. Foxxie, this adorable little Mini Flopsies stuffed fox, has very soft rust fur, white and black accents, perky ears, and a sweet face. Chip is a stuffed chipmunk from our Mini Flopsies collection that would love to call your nearby tree home.